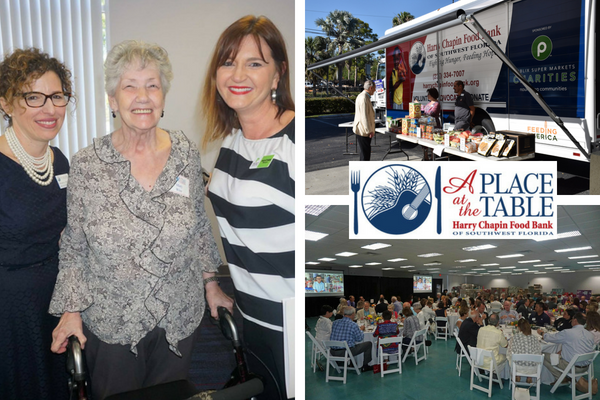 Harry Chapin Food Bank recently hosted “A Place at the Table,” a free, educational event to begin the conversation about food insecurity and the steps we can take together in the fight to end hunger in Collier County. Generously sponsored by FPL, the unique event held April 19 at Harry Chapin Food Bank in Naples exposed more than 80 guests to the choices many families, seniors and other individuals must make in order to put food on their tables. The experience was designed to raise awareness about the prevalence of hunger issues in Southwest Florida in general and Collier County specifically. To help demonstrate what it’s like to not have enough food to eat, guests were given envelopes that contained compelling stories from a variety of individuals who are food insecure – some who have only $2 to spend on dinner for their entire family and others wondering when or if they’ll eat again that day. Based on these real-life examples, participants were each given a limited dollar amount before walking through a cafeteria-style line to see what food their money could buy. With only $2 to spare on their meals, guests were faced with a difficult question: “How will I fill my plate?” The answer didn’t come easily. During the event, those who receive support from Harry Chapin Food Bank shared their personal stories of hunger, one a 79-year-old who – on a good month – has $30 to spend on groceries, and one a married mother of four who doesn’t qualify for financial assistance and must decide whether to pay for food or her children’s necessary medical bills. The evening concluded with insightful discussions led by Harry Chapin Food Bank employees and board members that brought attention to these often-unseen hunger issues in Southwest Florida. To learn more about Harry Chapin Food Bank and supporting efforts to end hunger within the Southwest Florida community, please call 239-334-7007, email fighthunger@harrychapinfoodbank.org or visit HarryChapinFoodBank.com for more information. Founded in 1983, the mission of the Harry Chapin Food Bank is to lead the community in its fight to end hunger. Serving five counties in Southwest Florida – Charlotte, Collier, Glades, Hendry and Lee counties – the food bank rescues, inspects, transports and distributes donated food and other grocery products to more than 150 partner agencies that provide direct services to those in need. Partner agencies include church food pantries, soup kitchens, emergency shelters, disaster relief agencies and more. The food bank provides food for about 28,000 individuals each week. During fiscal year 2016-2017, Harry Chapin Food Bank distributed 22.3 million pounds of food, which equates to 18.6 million meals, a total value of $37.3 million.